You like our Ticket Frames and Ticket Stands. So do we. But not every ticket from a collection can get the high-end treatment. 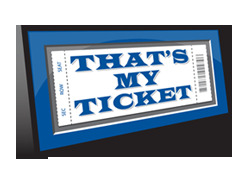 So for those tickets that you want to display as well as protect, without emptying your wallet, there’s the Ticket Screwdown. Ideal for desk-tops and bookshelves, these displays will protect your tickets from damaging as well as let friends and family see all the great events you’ve attended. Your tickets will tell a story, so let them start talking.